As a kid, I made cooking for me a struggle for my mother. I used to be extremely picky and taste conscious. If there was something that i hated it used to rava upma and idlis (steamed cakes) made from rice batter. This put my mom in a constant mode of experimentation with food. The result of one such experiment was idlis made from semolina and vermicelli and i instantly fell in love with the taste. With the boom in the instant food market, instant rava idlis and dosas are readily available everywhere but it doesn’t match up my mom’s rava semiya idlis. Dry roast vermicelli and semolina separately till it is light brown. Mix the two and place it in a dry dish. Heat ghee/clarified butter in a pan. Fry the cashews and raisins separately in ghee till golden brown and add it to the vermicelli-semolina mixture. In the same ghee add mustard seeds, once it pops add the chopped green chillies, ginger, asafoetida and finally the curry leaves. Add this to the vermicelli-semolina mixture and mix well. Mix well the vermicelli-semolina mixture, whipped yogurt/curds, baking powder, chopped coriander and salt. Pour this into idli moulds or any steel mould and steam for approximately 10-15 minutes. Serve hot with coriander coconut chutney! This mixture can be made in advance and stored in the refrigerator in an air tight container. 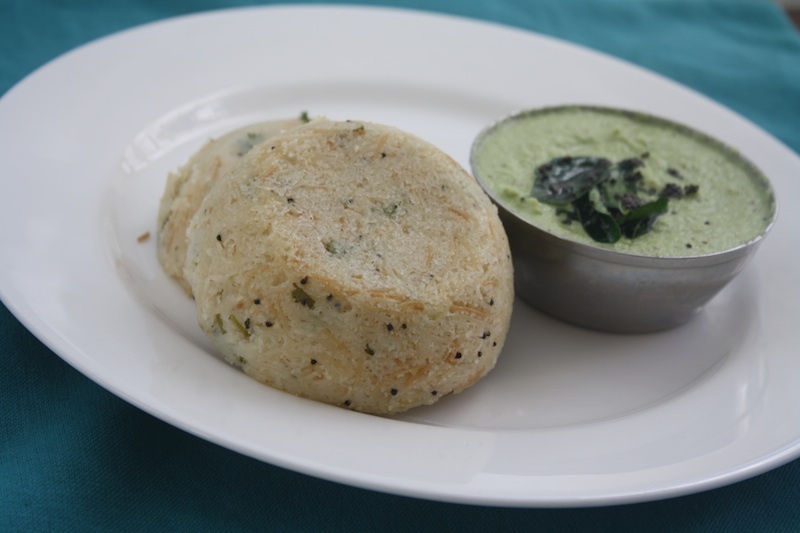 The idlis can be made as and when required. I used homemade yogurt/curds for the idlis. Bought out curds tend to be thicker so you may reduce the amount of yogurt a bit and add some water/water. Looks yummy! I have had aunty's semiya idlis once. They were very tasty. Made this last weekend. And man was it a hit!!! Thanks for the keeper recipe.. I have done this before using another recipe and it is not an experience I wished to repeat. But your pictures inspired me … Thanks Achu….